With our FA moves the last week or two I went with Barkley. He would help running the ball, blocking, receiving and keeping the def fresh. A future with Winston, Evans, Howard, Barkley... damn. Before FA moves I’d go Chubb, Nelson, Barkely. After FA moves I’d go Barley, Nelson, Chubb. 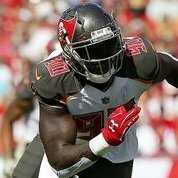 Im thinking that James will be the pick weather we stay at 7 or move down I’m thinking the Bucs like James.